An intriguing line on a stunning wall. Written In Stone is the first line to breach the impressive and often eyed headwall to the left of the Prow. Different than it’s burly neighbors, the character of this route is generally technical face with a smattering of finger cracks and flakes. The initial 5.10 pitches get you warmed up for the increasingly difficult climbing capped by an exciting and atmospheric crux. The route is generally well protected, often with bolted cruxes. 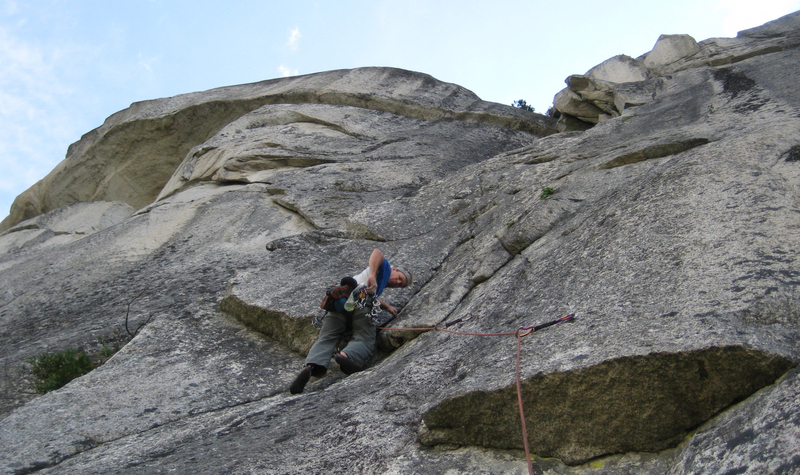 Navigating an ocean of granite on pitch 7, 5.11c. From the top of the Apron, continue up the Buttress trail passing under the imposing Kashmir Wall. The first pitch lies immediately across the South Gulley just right of an obvious large cedar. 1. Starts by climbing a stepped, left facing corner. 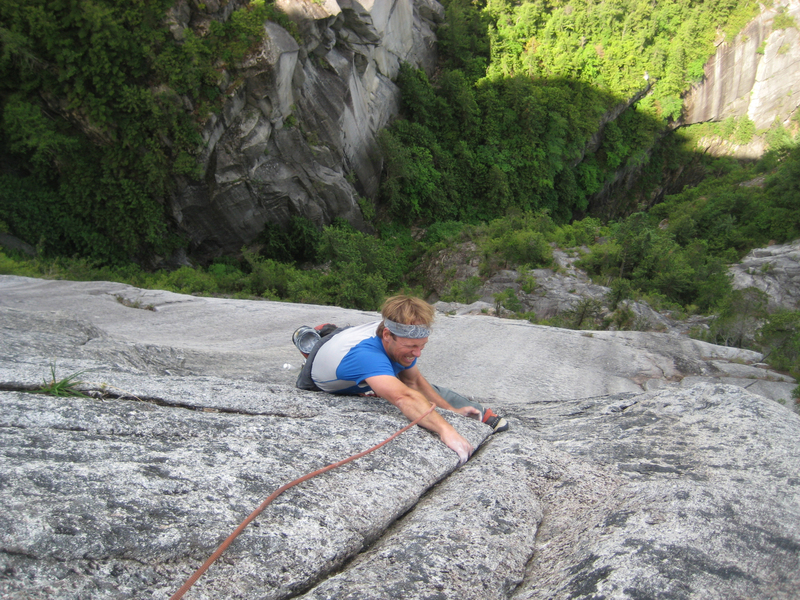 A difficult mantle and face climbing past 2 bolts leads to the belay. 510c. Scrambling and low fifth across the ledge and up to the base of pitch 2. 2. This pitch connects discontinuous finger cracks up the long buttress depositing you on Bonsai Ledge. 5.10c. 3. Layback and jam up the big flake. 5.10b. 4. Face climbing straight up past two bolts. Follow a long, easy traverse to more face climbing straight up to a short layback flake. 5.10c. 5. Move left and up an easy corner until you can traverse back right under a ledge. Climb the elegant twin dykes past 3 bolts. 5.11a. 6. Climb straight up a deceptively difficult, thin dihedral, passing small roof on the left. 5.11b. 7. Thought provoking face climbing past three bolts leads to a short crack, the crux moves left gaining the arete and a hand/fist crack to the belay. 5.11c. 8. Bouldery moves off the anchor lead to a testy fingers dihedral. Finish via an exposed hand traverse right to a wicked thin crack. 5.11d. Pulling over the lip at the end of pitch 6. 5.11b. Single set of cams from #0.1 – #4 BD. 2x #0.3, #0.4. Small wires. Quickdraws. All belays are bolted. Walk off second summit trail. Alternatively the route can be rappelled with one 70m rope. From the bottom of pitch 6 the rap line bypasses the traversing sections of the climb utilizing an intermediate anchor. Oh my God! That looks SO awesome. Are there any sport climbs up there? no but if you go, have at least 3 extendable draws…you know, the trad ones! At the end of pitch 4, can you rappel to the base? It’s not clear if you go straight down or are trending right to the start point. Can you mark the anchor locations on your image? Nice work. It would be difficult to descend from the top pitch 4, you would be offline and adventure rapping through the trees. From the top of pitch 5 however it would be easy, basically straight down (trending slightly climbers right) is an intermediate anchor on an obvious ledge. 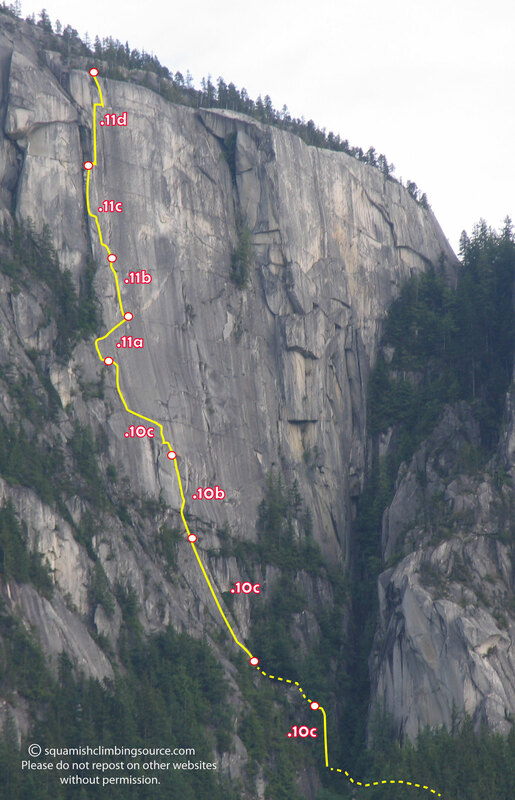 Keiran B. and I climbed this route yesterday, I’d give it 5 stars. All of the 5.10 pitches are super fun, the second pitch follows some shallow cracks up a slightly less than vertical face. The 11’s are all quite techy, the 11 b crux, just before reaching the roof has delicate feet which I stemmed. The 11c is though provoking with a slab feel to it… I had to analyze the rock for quite a while before figuring out the moves. The final pitch, the 11d was my favorite. The bouldery start is hard, but the moves all flow together into the dihedral. After the traverse it throws you right into a crux of super thin fingers. I placed a silver offset then punched it. The bolts were all in the right places, and the gear solid the entire way. Honestly i’m surprised this line hadn’t been done earlier, its so prominent. Great job Colin and Andre. The 10b layback flack and the 11b and the 11c pitches were very good (great job connecting the dots for the 11c in particular). The last pitch is definitely absolutely not a sandbag at all :P. I feel like this route could benefit from an alternative finish though – if only so it sees more traffic. Instead of stepping right onto the face off the tree stump belay I noted that the roof crack directly above (with a bit of cleaning) could be a real classic. Thanks for putting this up guys – it’s great that there’s an accessible-to-plebs free route on the Prow Wall.